David Tajchman is an award-winning architect working at all scales and in various disciplines. 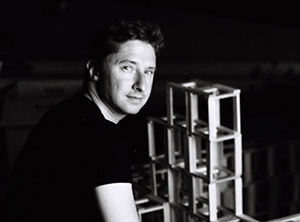 He graduated in architecture in 1999 from the Victor Horta School in Brussels, and did his post-graduate studies in architectural design in 2003 at the Bartlett School in London. He founded his studio, Architectures David Tajchman, in 2009. It is a multidisciplinary design studio based in Paris, whose practice spans the fields of architecture, design, installation art, performance art, video art, writing, and education. His studio has been designing at all scales for a variety of clients, programs, and cities. It seeks out visionary clients whose projects demand new and innovative solutions. The work of the studio has become, over the last ten years, an influential force in the culture of contemporary architecture. Since 2016, the studio has initiated its own research through design projects, such as "Gran Mediterraneo," a Tel Aviv-specific mixed use high-rise; "Hanging Automotive Gardens," an automated parking silo and pubic garden for Paris; and the "Topological House On The Rocks." Today, the studio continues to develop its repertoire of design possibilities through new projects. Tajchman has been teaching architecture since 2009 at schools and universities located in France, Sweden, Canada, and Israel. He is an art director working on experimental films. Using architecture as a filming tool, where bodies, geometric rules and narratives are at the focus of his cross-disciplinary art. Tajchman is also an author; he is currently editing his first book about the Gran Mediterraneo, a self-initiated research project on the Tel Avivian skyline, to be published by Actar (Barcelona-New York) in Fall 2018.